It's all over. That's it - London 2012 has officially ended. The torch was turned out by two of Paralympic GB's teenage stars, Ellie Simmonds and Jonnie Peacock and now Great Britain must deal with post Olympic blues. No more events on the tele, no more news of gold medals. We have to go back to watching boring Daytime TV, which will be even worse than it is usually now with no Great Britain team to back. What a summer of British Sport, and congratulations to all the athletes! I have been on my own incredible journey, one which I will never forget - one which started around two years ago. When I heard an army of volunteers, named 'Gamesmakers' by LOGOC, I jumped at the chance to apply. I thought "why not?" A Olympics was only going to come round probably once in my lifetime in my home country, and I wanted to be a part of it all. Anyone who knows me will know I love Sport, and the Olympics in Beijing a couple of years before was inspirational and to know have it in London, in the United Kingdom, was hugely exciting for me. So I didn't hesitate filling out the application form online and patiently (well maybe not so quite) waited to hear back. A YEAR later, I eventually got an email saying I had an interview. Result! An interview at ExCeL followed and I was determined to prove to my interviewer that I was passionate enough to be a Gamesmaker. 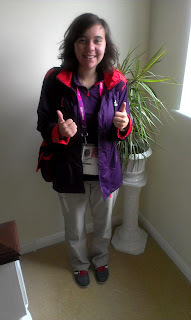 It paid off - a couple of months later, I got the news I had become a Gamesmaker at the Paralympic Games. WOW. My job was a Transport team member at the Paralympic Family Hotels; these hotels were Grange St Pauls and Grange City. I soon found out through role-specific training and venue training what exactly I would be doing; helping clients and drivers out with the BMV fleet of cars used to ferry people to and from the two hotels. I couldn't wait to start, and getting my uniform was pretty good - I love the shoes in particular! The big day arrived and my first shift was at Grange City, which I found is considerably smaller than Grange St Pauls - and I loved it. 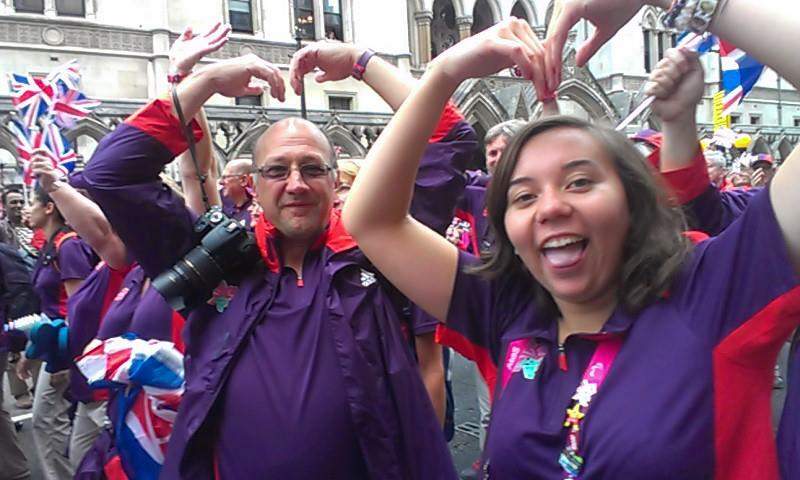 I worked with some lovely Gamesmakers, all of us having a laugh and getting on so well as we worked, helping the cars and then with the coach service used for the Opening Ceremony. We were also lucky enough to go watch the Paralympic torch relay as it passed Tower Hill on our break; I had missed the Olympic relay so to be able to see the Paralympic torch relay was great! I met some very interesting clients too from all different countries and as I soon found out, pin-collecting from this countries became very addictive. I had six shifts in total, and I loved every minute of it. Yes it did involve standing around a lot, but I was working every day with great people and meeting equally as great clients. I had a conversation with a IPC member about KFC one day, then a hug from the Sports Minister from Azerbaijan the next! Another day, Dame Kelly Holmes came out of the hotel and said "good afternoon" to all us Gamesmakers outside; it's not every day you say "hiya!" to an Olympic legend! I also managed to speak to the woman who gave Richard Whitehead his 200m medal in the Athletics, and she praised London and both the Olympics and Paralympics very highly; in fact, every client I met and had a little chat with said the exact same. London had been a hit. 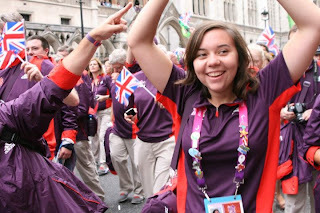 I had a sense of sadness when I hung up my high-vis jacket for the last time and walked back to Blackfriars station, knowing I had the Great Britain Athletes Parade left to wear my uniform for the last time then it would all be over. But what a way to finish my experience. 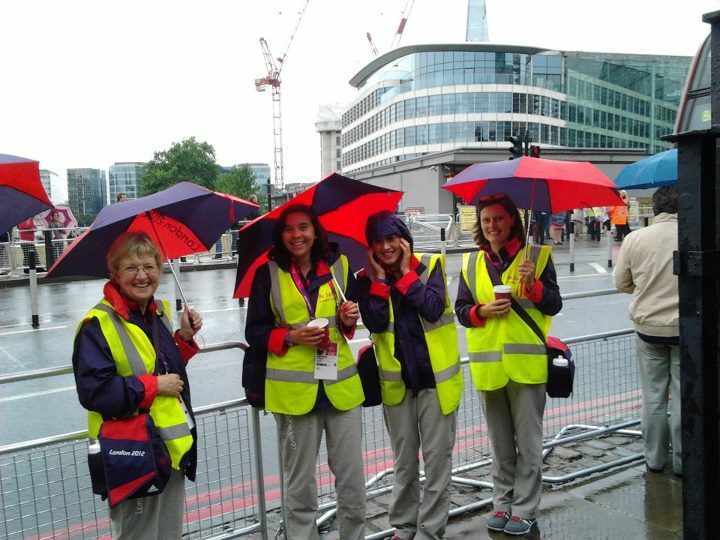 I watched the parade at first at St Pauls, right next to the hotel where I had been working at and stood with about 20 other Gamesmakers, all in our purple uniforms. We whooped and cheered as the floats carrying the athletes went past us one by one and we cheered even louder when some of the athletes spotted us and pointing at the group of us, would shout "Thank you Gamesmakers!" Katherine Grainger, Greg Searle and Sir Chris Hoy were just some who did! We then noticed some Gamesmakers walking behind the parade, some carrying a banner. Immediately we spoke briefly to the steward next to us, and to our amazement, she opened the gate for just us Gamesmakers to join the parade! Wow! 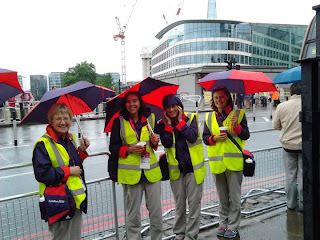 I couldn't believe it - I was walking behind the GB athletes with my fellow volunteers. As we walked the crowds were cheering, shouting out well done and thank you as we passed. We would hi-five the people at the front, a lot of people had cameras out, taking pictures as we walked along, waving and sometimes chanting "Team GB" as we continued on towards Tragalfar Square. 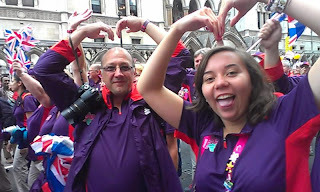 I also bumped into someone I work with and together with hundreds of Gamesmakers, we walked along the route. We all agreed - as much as we would have loved to have been along the mall, this was ten times better. To put it simply, I loved the whole experience - it is one I'll never ever forget. To me, the best part of it all was meeting and working with some truly fantastic people. And to have finished it all with a fantastic day at the Parade was amazing. I am so glad I decided to register all those months ago, and I am so so proud of London and both of the Great Britain teams - you have inspired us all and have done the country so proud. We salute you all! 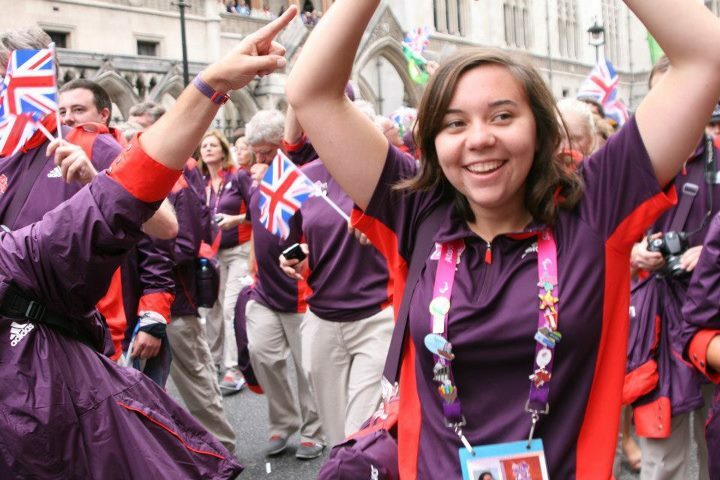 I'm so proud to say I was a part of London 2012, and I am so proud to say I was a Gamesmaker.